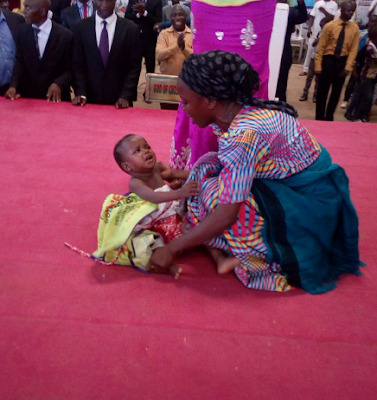 A member of Lord's Chosen Church shared a shocking story of a dead boy, who got resurrected during a prayer session at their Charismatic Ministry. Sis Helen Michael will never forget this day in the annals of her history. Her miracle is that which is not common among men. She came with a sorrowful heart to the service today as a result of her son (1year plus) who was terribly ill and later died on her way to church. She's was so optimistic that God would bring him back to her life. 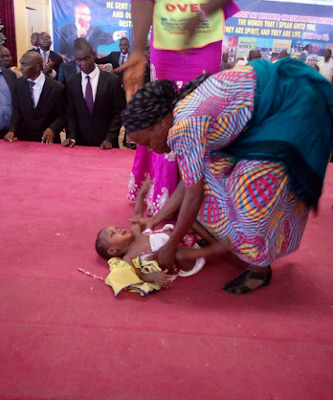 Her implicit faith was brought to life when our beloved Daddy in the Lord was praying during INSTANT MIRACLE SESSION, the lifeless baby sneezed and came back to life. Her testimony caused an uproar in today's service. Indeed, our God is faithful. Do you have a hopeless situation? The only good God who remembered Sis Helen shall remember you today. I can see everything turning around for your good in Jesus' name. See the moment the mum, with joy, lift her boy up!